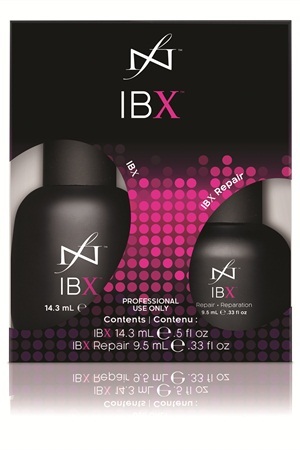 Famous Names introduces IBX, a new protective treatment system for use under all gel-polish products. The two-part system, comprised of IBX and IBX Repair, provides a shield against damage commonly associated with the soak-off process. Famous Names refers to IBX as a “built-in insurance policy” and a “best friend” for the natural nail. Both products penetrate into the nail plate with the help of heat and penetrative oils and work to toughen the nail from the inside out. Famous Names’ motto for the product is “creating strength from within.” Rather than merely acting as a buffer between the natural nail and gel-polish, IBX seeps into the nail for a deeper protection. It’s applied just like polish and cured with an LED light. The system can be used as a preventative treatment under clients’ gel-polish or for clients whose nails are already damaged and wearing thin from gel-polish removal routines. IBX can also be worn on its own on bare nails to provide clients with a more natural look while still fighting against peeling and delamination and aiding the growth and strengthening of nails.